The calendar reminded me that Saturday April 22nd was Earth Day! That day was a worldwide day of demonstration and remembrance that our planet needs care. On September 2014, I happened to be in Melbourne, Australia, for the Climate March. A sign always haunts me from that event: it featured an Earth globe in a poor shape, with that simple and yet powerful message: “You would not treat your Mother like that!”. Right on! It is very human to be distracted and lose this grounded connection to Earth, our only home. What did you do? Did you plant a tree, start a garden, reduce your waste, buy local, eat less meat, ride a bike instead of driving your car? Earth-friendly actions are endless. It can only be successful if it starts with yourself. Living on Kure is the apprenticeship to become minimalist and self-sufficient. A very low carbon footprint is crucial in a wildlife sanctuary to ensure that our activities do not compromise the ecosystem. Also, daily, we see the negative human impacts on the ecosystem. This comes from a 30+ year period of Kure as a Coast Guard Station, to living thousands of miles away from a city, as well as from climate change. Everything is dynamic on Earth, nothing is static. The atoll has a shocking constant accumulation of marine debris, the introduction of numerous alien species (plants and animals) in Kure pairs with human arrival, sea level rise is very concerning to an island with a mean elevation of 2.8 (SD 2.0) and animals come further away from their primary habitat because of scarce food resources. We can do so much damage to the environment in a short amount of time. But, we can also turn things around for the greater good. Earth day is EVERY DAY on Kure by ethic and it is a profound source of personal inspiration and optimism. This post is to give you some hints about our weekly schedule and observations on Kure. We closed-up our fifth week on Green Island, time flies! Now, we got a pretty solid routine. Activities depend on the weather, wildlife events and if returning to Camp from the field late in the afternoon. We celebrated JE’s birthday with words of gratitude. We burnt invasive plant seeds collected during field activities and paper trash while looking at a sky full of stars. This happens only a few times a season as needed, weather and wildlife permitting. Thirty-two restoration areas (RA) were successfully treated to eliminate and control invasive plants. It includes the RAs left from the Winter Season 2016 (mission accomplished!!!) and others from our Summer Season 2017. Each season, the crew completes the treatment of the entire island (188 acres) at least twice, ideally 3-4 times, during the six-month period. The RAs were overall weedy, including “fields” of Lobularia maritima, our infamous trio of grasses – Eleusine indica, Cenchrus echinatus and Sporobolus pyramidatus, and the fragrant Coronopus didymus, among others. We hand pulled our very first tall Verbesina encelioides (VERENC), a daisy-like plant, the tallest were approx. 6 feet high. Few had viable and drop seeds (dang!). We also “sushi-rolled” our first Cassytha filliformis (CASFIL) infested plants. CASFIL is a parasitic vine that reminds me of the Adams Family hand. It has specialized roots that reach far and penetrate host tissues, often native plants, to absorb nutrients. It uses its dying prey as a trampoline to attach to other close species. It can even feed on other CASFIL…To me, that is the creepiest invasive plant on Kure but truly an amazing force of nature. All outbreaks of invasive plants and drop seeds get marked with a GPS waypoint and specific colored flagging. Currently, the island counts 15 native plants and 33 non natives. While VERENC is the main target plant to eradicate from the island, the other invasive species are controlled concurrently to provide more land for the native seed banks, as mentioned in the Department of Land and Natural Resources (DLNR) 10­ year program management plan. The ultimate goals are to restore seabird habitat and promote dune stabilization. While working close by beach sectors, we removed hundreds of pounds of marine entanglement debris collected and secured by the Winter crew at specific locations. The weather has been variable. We had a few hot days approaching 80 degrees, others with NNE wind at a maximum force of 21 mph. It brought cold mornings (mid 60ish degrees) but thankfully the sun would warm up during the afternoon to mid-70s degrees. These coldish temperatures were a treat when working in dense field of Naupaka (Scaevola taccada, a native shrub) but not so much for the outdoor shower that followed – which was reviving, for sure! It rained once which gave us the opportunity to complete some maintenance such as cleaning the water catchments (for our facilities and for the Laysan ducks), entering data (always always always!) and work in the nursery. We planted native Akulikuli (Sesuvium portulacastrum) and Koali ‘Awa (Ipomea indica) cuttings in pots, transferred some Popolo (Solanum nelsonii) from a flat seed tray to individual deep pots, broadcasted native seeds of Lepturus repens in the Camp RA, which were previously collected at Northeast Point RA, among other plant activities. Each week, we monitor the population of the endangered Laysan ducks at the seeps and guzzlers while looking for potential mosquito adults and larvae. Recently, the water sources were treated to control mosquitoes. No mosquitoes detected since, fingers crossed! Once a week, we conduct Hawaiian monk seal and shorebird surveys. Common shorebirds include Pacific golden plovers, Ruddy turnstones, Bristle-thighed curlews and Wandering tattlers. We took GPS waypoints and marked nest sites of Masked and Brown Boobies and Grey-Backed Terns as they were discovered during RA treatment. The island is currently a nursery station and, thus, the cutest place ever! 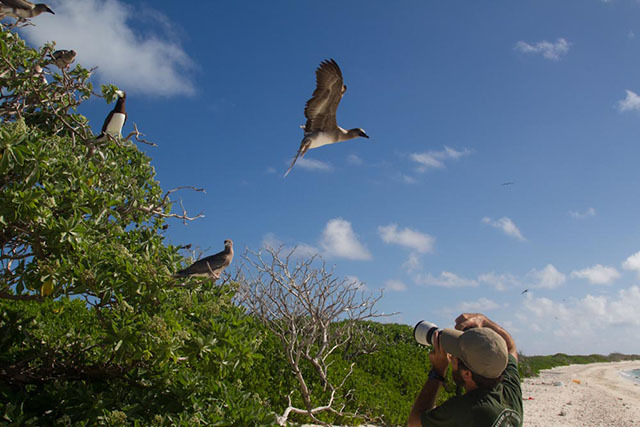 Some species are laying eggs (such as the Sooty terns and Black noddies) while others have downy chicks (Red-tailed tropic birds, Brown boobies), partially feathered chicks (Laysan and Black-Footed Albatross, White terns) and already juveniles (Red-footed boobies). The Albatross chicks, the most abundant on the island, seem lately to feel more adventurous which get them in trouble sometimes. So many of them are rescued from burrows (holes made by underground nesting birds such as the Bonin petrels) or one that was too close to the duck guzzler… Poor cuties! Not to mention also that we have currently 11 endangered Hawaiian Monk seal moms and their pups on our beaches! In addition, we are (impatiently!) waiting for new broods from the founding Laysan ducks. Of course, one is tempted to stare closely at these cuties for hours, right? However, during the crucial time of parenting, human disturbance should be a minimum. If flushed, some bird donʻt return to their eggs, or break it accidentally, or the Iwa (Great Frigatebirds) would come and steal nesting materials dropping the eggs, or they can even eat the downy chicks. Each disturbance we create gets recorded in our data log and avoided at all costs. Binoculars and long zoom lens cameras get very handy! While at the pier for some leisure time, we observed a Green sea turtle, sharks (often Black-tip), Spotted eagle rays and, once, lots of Man-of-War jelly fish (yikes!). Besides this busy schedule, we do find some time to relax and these moments taste even better that way: reading, writing, watching movies, listening to music, yoga, cooking, beach (if no seals! ), sleeping and, yes, house tasks we can finally achieve! I am sure you would like to know more in detail about what I just listed above: the plants, the animals, our lifestyle on the Green Island without mentioning our unique sunrises and sunsets and night skies full of stars, powered by the moon. I dedicate the next posts to those themes. We have five months to go, thank you for following our journey!